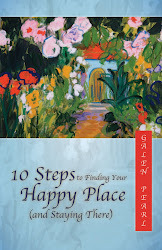 10 Steps to Finding Your Happy Place (and Staying There): It Was the Best of Times. It Was the Worst of Times. The truth is that it doesn’t really matter who won the presidential election yesterday, unless we can quit demonizing those who don’t agree with us and work together. Picture two enemies in a canoe arguing about the best technique for paddling, or even trying to knock the paddles out of each other’s hands, as the canoe is swept downstream towards a waterfall. That’s what our polarized partisanship reminds me of. Yesterday’s win will be a hollow victory if the real danger to America is not addressed. The real danger is not the deficit or terrorists. The real danger is our refusal to see that we rise or fall together. When Hurricane Sandy laid waste to the East Coast, first responders did not ask a victim’s party affiliation before offering help, and victims did not vet their saviors for political correctness. Years ago, when two of my daughters were gridlocked in bitter hostility, I, in desperation, offered to pay them each a dollar a day to get along. I didn’t care anymore if they liked each other, or if their overtures were sincere. I cared that the fighting stop. Here was the catch: they would have to earn the dollars as a team. They either both got the dollars or neither did. I was the decider, and there was no appeal. The amazing thing was that although their initial efforts were only superficially civil, the pattern was broken, and it wasn’t long before they really were working together toward a common goal. Did disagreements still arise? Of course. But they quickly shifted to cooperative solution mode rather than getting all churned up in their previous blame/attack mode. There is nothing like watching the election returns with a friend who comes from a communist country to put things in perspective. As I spent the evening trying to explain what was happening to someone for whom the whole concept of voting is unfamiliar, I could see the process from an outside perspective. True, in her country there are not billions of dollars spent on campaigns, and government policies can change without endless debate and years of court challenges. But as I listened to her amazement that people could voice their opinions so freely, and her disbelief that those numbers on the screen represented individual votes that were actually being counted, I felt blessed. Maybe you feel blessed, too. So I invite us all to consider how we participate in and how respond to our electoral process. Although our system is based on a win/lose model, no one really wins unless we all win. Instead of all the vitriol and gloating, I invite us all to find someone who voted for “the other guy” and extend an open hand. More important, I invite us all to extend an open mind. Mitzi, I'm so glad, then, that I went ahead and wrote this. Hugs back atcha. Oh Galen.....you, my friend, picked a "tricky" subject today. Although I totally agree with the open mind concept.....our forefathers formed a Democracy.....I only hope we are able to stay that way....no matter who is in control. Jo, Tricky, yes! I was hesitant to write this because I didn't want to get into political debate. This country was formed as a democracy, with all the independence and all the imperfection that entails. Whether we like or don't like the outcome of an election, we all have a vote, and we move forward without the violence and bloodshed I experienced first hand after an election in another country. You are so on target! Until we align with our commonality, we are lost. Sandra, I hope we can all take a deep breath and do some inner centering. Very wise. Truth in there. Hopefully the outcome will be wonderful and America can stand proudly again and realize what "we the people" truly means. Our leaders seem to have forgotten. Gail, I guess it's up to us to model that for them. Thanks for commenting. We are all in this together. Really. Galen, this is a well-thought out and helpful post. You're right--we rise and fall together. I like the technique you used with your daughters. Tina, It was a technique born of desperation but it was so successful, I've shared it with other parents! Thanks for your comment. Bravo. Well-stated and so important. To me, it is one world, Galen. :D Hugs. And yes,we are all interested in what is happening with the largest democracy in the world. As far as India is concerned, of course we hope Obama will becomes lenient with his views on outsourcing. That said, it is One World :D Hugs! Loved what you wrote. Vidya, Yes, that outsourcing issue is a sensitive one. Love your one word! Love the Pogo quote. I think that sums it all up! We have to look within! Jodi, Here's a Rumi quote I couldn't fit into the post, but goes well with the Pogo quote. "Yesterday I was clever, so I wanted to change the world. Today I am wise, so I am changing myself." Not to split hairs but the country was formed as a republic. The problem from the beginings of the republic is that there is so much wealth at stake for those who can controll it. The "Robber Barons" of the late 1800s and early 1900s have left a legacy of money and power to their decendants. Those people are playing the long game. They have consolidated their hold on media, education, politicians and the Supreme Court. This election is heartening in the sense that it shows that the plutocrats have limits to their reach. The 99%, or maybe the 90%, really need to pay attention to the nuts and bolts of how our country is being run and refuse to let the moneyed elite continue to reserve the fruits of our labors for themselves. Collin, Thanks for the historical perspective and your observations. Your suggestions can only be realized by first looking within ourselves and working together. I hope that's what we will all begin to do. Thanks for commenting. Wonderful post. It is applicable to all.Universal. If only the leaders of the world listen to this simple truth. Pattu, I think the leaders will start listening when we start listening. It starts with us. Thanks for commenting. Wonderful truths here Galen! Until we start working as one nation and not be so divided, we are never going to move forward. I hate how vicious some have been I wish they could see the bigger picture and just agree that, that are things we are going to disagree on and figure out how to work together. Alecia, Thanks for much for passing the post along. I really appreciate it! And yes, we have to be able to disagree with respect and compromise. "We have seen the enemy and he is us." When the bitterness and gloating subside we still have to live with our choices. You have hit the nail right on the head! One Nation Under God is all I can say when I hear so many arguments and sides being taken. Bonnie, Thanks for adding that reminder. Fabulous words and very true - honestly shared. Wouldn't it be nice. People need to start talking... yep that paddling together. Patricia, What a perfect story about people transcending differences to help each other. Thanks for sharing it. Galen: You are one of my favorite people in Blogland. JJ, You made me laugh out loud in delight. I've said it before: You are a big sweetie! Thanks for making my day. Thank you so much for this, Galen. I'm not sure you saw the conversation on my FB wall, but the tone of it scares me. I wish more people will see the benefit of working things out for the better of all. Corinne, Oh, I know! I just quit looking at FB the last week. Just too much negativity and finger pointing and ridicule and sky-is-falling prophecies from both sides. Really, that gets us nowhere. I think if we could really truly hear ourselves and understand the power of our thoughts and words, we would pause before speaking or writing anything. Galen, thank you for offering your perspective and thoughts. Our economy is closed tied to what happens in the U.S, and therefore, we are always keen to keep abreast. I certainly enjoyed reading your post! Evelyn, Proving once again that we are all connected. Thanks! Linda, Then I'll vote for puppies and we can be just like the Republicans and Democrats. Or not. I'll hop over and read your post. Thanks! I love your quotes and of course, as a US citizen, I couldn't agree more. My family is a divided household and we try to honor and respect each other. Why can't we have different opinions. And why the anger towards the different opinions. It's time to get along!!! Betsy, Families have to do it, and what are we as a nation or even as a global community if we are not family?! Thanks for commenting. I am in Agreement that unless we think in terms of the Whole, we risk far too much. I for one wish political parties were a moot point and each Politician worked in Unity for what common Goals would be beneficial to not just our Nation and the people in it, but the World as a Whole. Coming into Agreement and working WITH each other rather than against one another would be far more beneficial to ALL. You always have such thought provoking Posts my Friend. Dawn, Good point that parties necessarily polarize. On the other hand, they are almost inevitable groupings of like minded folks. But as you say, working with rather than working against, with a view to benefit everyone, is the key. Thanks for commenting. It is worth noting, though, that the polarization we have seen in recent years has been asymmetrical. The right has moved a lot further to the right than the left has to the left. Our president resembles nothing so much as an Eisenhower Republican, and yet he is being compared to Castro. I too would love to see more genuine bipartisanship, but I'm hoping that the defeat the Republicans have suffered this cycle will help the reasonable ones to part ways with the rigid reactionaries for whom compromise is out of the question. I don't think real bipartisanship is even possible unless that happens. Elliot, You make some good political observations. There are many levels one can analyze. For me personally, the issue isn't so much who is being reasonable or unreasonable. The issue is whether I as an individual can drop all the labels and hold my heart open to those whose views are not like mine, even though I might disagree with them on specific policies. If I can do that, then however we move forward will be based on mutual respect and recognition that at some deep level there is no conflict. Thanks for adding to the discussion.